Sandman joins the Ring of Honor with winnings of $395,000 at the 2018 JJFISHWEEK. $1.75 Million up for grabs thanks to Seminole Hard Rock at Coach Jimmy Johnson’s Championship Fishing Tournament Week in Key Largo, Fl, March 2-9, 2019. Catch & Release Billfish and Weighted Meat Fish Categories available. Come & Get It! Brought to you by Seminole Hard Rock Hotel & Casino in Hollywood, Fla., the 8th Annual Jimmy Johnson’s “Quest for the Ring” Championship Fishing Week will take over Key Largo, Fla. March 2-9, 2019. 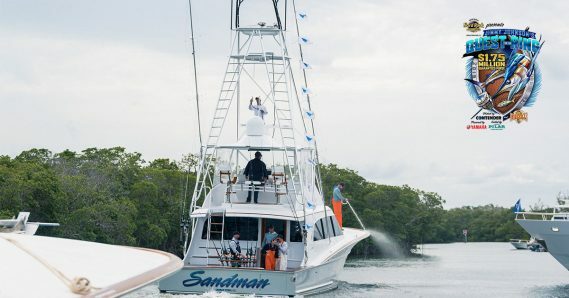 The annual 4-day fishing tournament includes the 1-Day Celebrity Charitable Pro Am and the 2-day Billfish Championship. Hosted by Contender Boats, powered by Yamaha and fueled by the newest presenting sponsor, Papa’s Pilar Rum, the 2-Day Billfish Championship features a Catch & Release Division, an all new Weighted Division and, in partnership with Seminole Hard Rock Hotel & Casino Hollywood, the World’s RICHEST guaranteed purse of $1.75 million. Competitive anglers from around the country will join together for another historic event in the beautiful setting of Key Largo, in the Florida Keys. Renowned for the best parties, the highest purse and the ultimate week of fishing, tournament highlights include celebrity charity days and highly competitive tournament showdowns. The 2-Day Billfish Championship prize structure is set and the guaranteed purse offers this year’s champions the chance to win one or more of 60 payouts at the 2019 National Billfish Championship. The final entry opportunity will be at the end of the Captain’s meeting on Wednesday, March 6, if spots are still available. Jimmy Johnson’s “Quest for the Ring” Championship Fishing Week is “all about the ring!” according to Coach Johnson. Each year teams vie for entrance into the highly coveted Ring of Honor, an elite group of champions who have taken home the top prize at this exciting competition. Members include Hardway, 4 Aces, Weez In the Keys, Native Son, Rock Star, Astra Sails and Sandman, the newest member. Each year the overall champions receive Jimmy’s famed National Championship Ring. Jimmy Johnson’s Big Chill Restaurant at MM 104 in Key Largo hosts the week long festivities. Guest accommodations can be made at Marriott Key Largo and Ocean Reef Club, among other locations. The kick-off event takes place on Saturday, March 2, at Seminole Hard Rock Hotel & Casino Hollywood, where anglers will be decked out head- to-toe with over $5,000 worth of fishing gear at the Gifting Experience before heading out to the ultimate Poolside Celebration. Then, the tournament takes over Key Largo starting March 6. Saturday, March 2: Angler Gifting Experience & Poolside Celebration at Seminole Hard Rock Hotel & Casino – Hollywood, Fla.
Wednesday, March 6: Packet Pick Up Kick Off & Captain’s Meeting at The Big Chill for JJ’s Celebrity Pro-Am and JJ’s National Billfish Championship. Thursday, March 7: JJ’s Celebrity Pro-Am, where Jimmy’s friends, celebrity athletes and entertainers will join the pros for a fun-filled day of competitive fishing in support of their favorite charities. That evening JJ’s Ring of Honor Champions dinner will be held at Ocean Reef Club. Friday, March 8 and Saturday, March 9: Registered anglers head out for two days of competitive fishing in the history-making National Billfish Championship tournament. Saturday, March 9, 6 p.m.: All tournaments culminate with a celebratory awards dinner and pool party as JJ’s Backyard BBQ takes over JJ’s Bill Chill. Participating anglers join together as over $1.75 million in prize money is awarded while overlooking the waters of the Florida Keys. Contender Boats is the official center console boat sponsor and a presenting sponsor of the tournament along with the official outboard sponsor, Yamaha, and official spirits partner, Papa’s Pilar. Hosting sponsors include Monroe County Tourism Development Council, Oakley Prizm, American Custom Yachts, Tunaskin and Grundens, who outfit the tournament anglers from head to toe on March 2nd. Official retail partner is Crook & Crook and the official tournament artist is Dennis Friel Art Studios. Additional sponsors are Land Rover South Dade, FLEX Auto, Garmin, Heineken Light, Papa’s Raw Bar, EDBL, Cuda and Celebrity Cruises among others. Boat Entry information and the full schedule of events can be found at www.jjfishweek.com. Registration can be completed on the tournament website or by contacting the tournament office at info@jjfishweek.com or 305-255-3500 for more information.